Have you seen this cuteness that has been circulating the web this week? All together now, awwww. So cute, a kid who actually likes Santa. 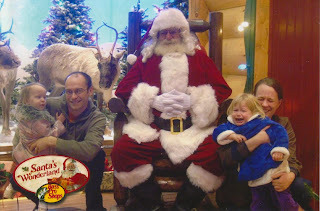 Though I am not convinced that that child is actually not animatronic because my own kids are terrified of Santa. "You want me to go sit on that big man's lap and tell him what I want for Christmas? He's a stranger mom! With a scary beard!". But because I get off on seeing my children cry we pump it up every year. "That's Santa!!! He brings you presents!!! He's nice!!! "If you sit on his lap I will buy you a cookie!!!" I think they slipped the kid a mickey before he met Santa. I LOVE your picture! We have one like that from last year, this year her cousins explained that he brings cool toys so she decided she likes him. I can't believe you know what a corner man is. I think my favorite part of this photo is your face. Haha. We didn't even try this year!